Is there really a path which could lead us to this elusive eternal bliss? I mean, is the ultimate goal of life to be insanely happy? When I first started blogging, I had this desire to lead people on the path of happiness… but I felt like a fraud. I wrote inspirational articles which I still believe in, but what I have realized along this journey is… happiness takes a lot of hard work. What is it about our generation that thinks we have a “right” to happiness? We live in this rainbow colored fantasy-land where it is not OK to be sad, negative, angry, disappointed, offended or different. Americans especially seem to feel the so-called American Dream would not be complete if we actually behaved like… well, humans. I contemplate this a lot. I stumbled upon something called “Science VS. ” by Wendy Zukerman. A podcast where they tackle things like “a gay gene” or in this case, the science of being happy. Intrigued, I kept researching more on this topic. The idea of happiness is big business these days. There are all kinds of Law of Attraction “secrets” which claim to bring everything you have ever wanted right to your doorstep… if you just shift your thinking, say positive words and push out negative thoughts. The entire universe will conspire with you to make it a reality; it’s so simple! There are YouTubers who explain in detail HOW to become happier than your wildest dreams; “Don’t watch the news,” and “drink more water,” all of your dreams will come true, they claim, if you just discover the secret. But the actual science of happiness is far more interesting and complex, in my opinion. Well, scientists have asked several thousand people about their general happiness level, then configure the similarities in background or financial status. They study everything from personality to external-factors such as income, age and their outlook on life. Dr. Emeliana Thomas of The Greater Good Science Center at the University of California says her findings are that happy people tend to be more grateful. Appreciative people tend to have more satisfying relationships and don’t suffer as much when something bad happens. So far, we see that happy people tend to have extroverted, grateful and optimistic qualities. But is it possible to become that type of person if your personality just doesn’t seem to sway in that direction? It seems genetics and upbringing play a large part in creating your personality, which in turn may effect your happiness level. Scientists have studied the happiness of twins, identical and fraternal, to figure out if genetics play a part. Zukerman mentioned a study of more then 2,000 twins which concluded that genetics could possibly account for nearly 80% of our happiness levels. “It may be that trying to be happier is as futile as trying to be taller,” claims the twin-study. These revelations also coincide with “The happiness set-point theory,” says Zukerman, a disputed notion which claims that our happiness level is set and not much anyone can do to change that. Life has it’s ups and downs but who we are “happy-wise” will always return to a base-line. So, if you are not one of these lucky, grateful and cheery people can you become one by trying really, really hard? What about the remaining 20% genetics don’t account for? In general, humans tend to see the negative; we are drawn to it. But, with making a conscious shift to positive-thinking it may be possible to change your general outlook as well. But this takes work; a lot of it. It seems as though there is some grain of truth with all of these positive thinkers, according to studies. Which always leads me back to Buddhism, not as a religion, but as a way of life. Siddhartha spoke of the Four Noble Truths and the Eightfold Path to happiness, which coincidentally sounds a lot like what science is just now discovering. Happiness takes a lot of hard work and training your brain, especially if you are hard-hard wired otherwise. Buddha said “All that we are is the result of what we have thought, if one speaks or acts with pure thought, happiness follows,” and maybe it’s as difficult… and simple as that. Know what makes me happy? These two. Loved your post and how you added scientific research to it. I believe that anyone regardless of their background or DNA can transform themselves into a more happier and positive being. It takes will power and dedication just like anything. Eventually repetition can and will reprogram the subconscious mind to behave differently. Excellent article, very well thought out, it is a very good read, so, I am going to rebog this article for you. I just very recently found your site but I see many articles that I am planning to read. So, in doing so I am quite sure that I will be reblogging several of your articles. I’m just so happy when people choose to interact and introduce themselves! Your time is appreciated. Thank you, from the bottom of my heart. 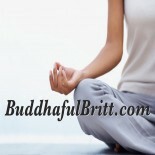 This entry was posted on October 24, 2015 by Britt in Britt's Banter, Buddhaful, Inspiratus and tagged buddhism, happiness, law of attraction, science of happiness, the secret.